Antibodies bind to their target antigens because the bumps and crannies in an antibody’s binding site complement the crannies and bumps in the antigen. Antibodies were invented by jawed vertebrates; sharks and all their progeny have antibodies, while lampreys and hagfish, which have a common ancestor with sharks some 500 million years ago, don’t use antibodies as such. Lampreys do, however, have circulating proteins that apparently play the same role as do antibodies, binding with high avidity to antigen and offering protection against pathogens. Those circulating protein (variable lymphocyte receptors; VLRs) look very different from antibodies, and generate diversity in a very different way. I’ve talked about these things before, here and here. 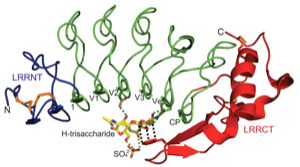 VLRs are interesting because (among other things) they combine extreme specificity and high binding affinity with great stability, making them intriguing pharmaceutical agents. 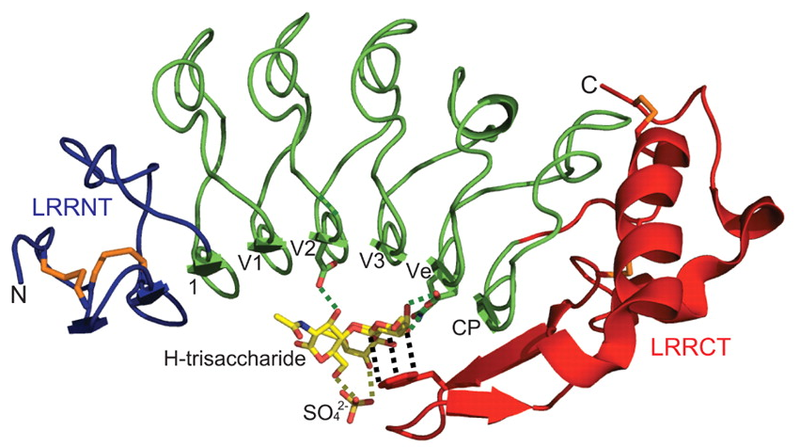 Now, Ian Wilson’s group has determined the structure of a lamprey VLR in combination with its bound antigen1 (in this case, a blood-group sugar, H-trisaccharide). Here it is, on the left. For comparison (but not to scale), a mouse antibody (in blue, as ribbons) bound to its antigen (in red, showing its surface) is on the right. (Click for larger versions.) 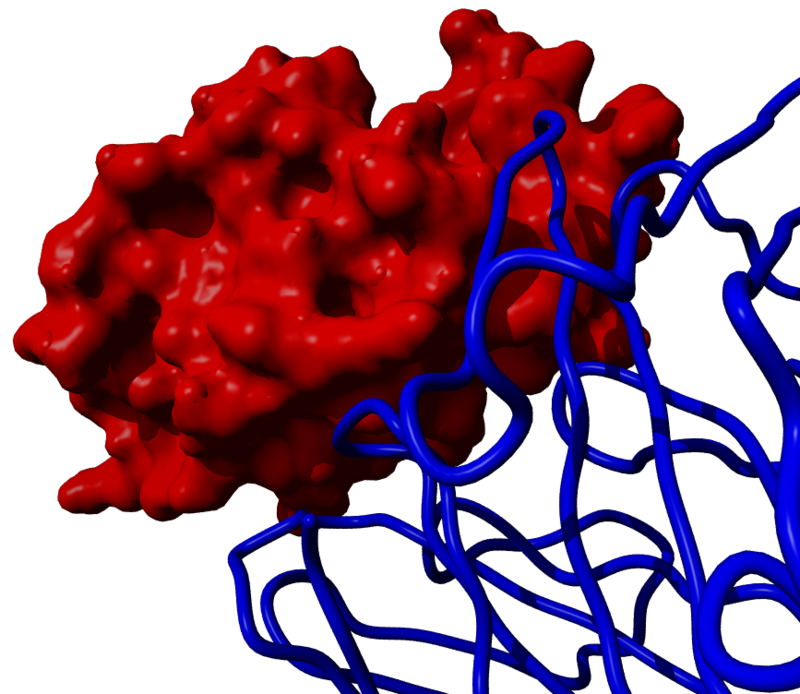 The VLR seems to bind at the “bottom” of its concave face, quite different from the antibody, as you’d expect. This entry is filed under Evolution, Science. You can follow any responses to this entry through the RSS 2.0 feed. Both comments and pings are currently closed. 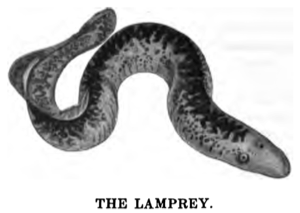 Lampreys are fascinating creatures. Amidst their not-so-friendly looks, they have contributed much to the advancement of scientific studies, especially on the immune system. Antigen is a complicated topic, but what gets my interest is how these materials work differently for each species.